Below are links to access/download various assets for author Mary Nelson Keithahn. If you need something that is not listed below, please email marynkeithahn@gmail.com. Mary Nelson Keithahn has drawn on a lifetime of experiences as a pastor-educator, pastor’s wife, mother, and grandmother in writing this collection of meditations and prayers. Her commonsense and thoughtful reflections on age-old questions of faith approach familiar scripture with a new twist, making each short essay a delight and surprise. Keithahn offers faith with intelligence, and her use of hymns is refreshing. Her ability to weave sacred stories from scripture with stories from her own life make this book rich indeed. A detailed table of contents makes it easy for readers to locate meditations for specific scripture readings and days and seasons in the church year, as well as for special life events. The imagery and nuggets of wisdom in this book will attract the readers’ attention, engage their imaginations, and stick in their minds long after they have read the last page. 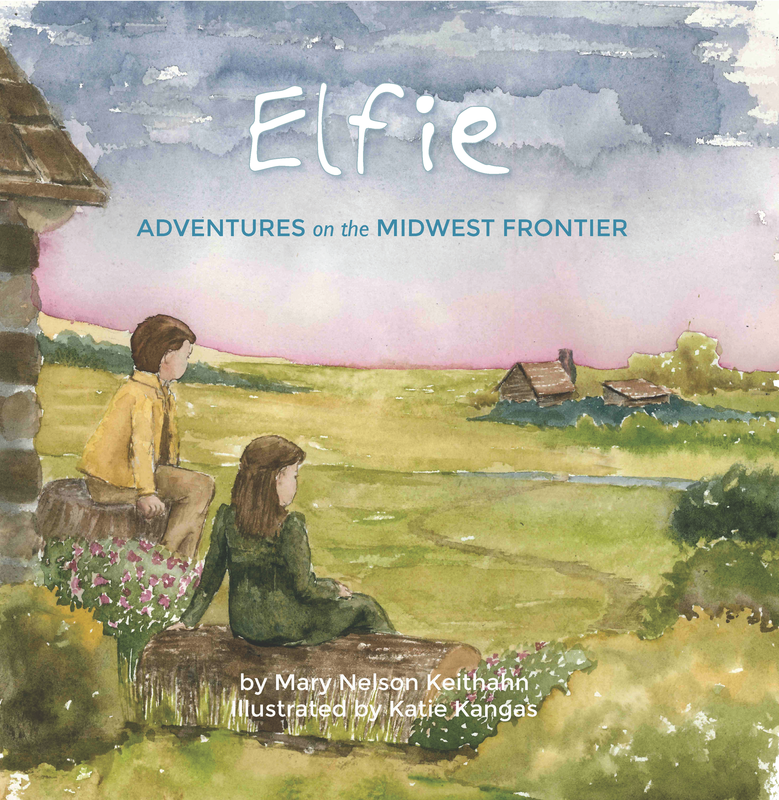 Adapted from the memoirs of Elfie May Loverin Minard and Frank Clyde Sheldon, Elfie’s “Double Cousin,” Mary Nelson Keithahn’s new book, Elfie: Adventures on the Midwest Frontier chronicles Elfie’s story as she and her family settle in the Midwest. A historical fiction chapter book for readers in grades 3-6, Elfie offers vivid descriptions of life on the American frontier. Questions at the end of each chapter reinforce understanding and expand discussion for young readers. Watercolor illustrations by Katie Kangas, Keithahn’s granddaughter, beautifully enhance Elfie’s story. Mary Nelson Keithahn will be simultaneously publishing two books in June 2016 – Elfie: Adventures on the Midwest Frontier, her first book for children, and Embracing the Light, a collection of meditations and prayers. Elfie: Adventures on the Midwest Frontier, a chapter book for children, chronicles the experiences of Elfie and her extended family as they find a new life in the Midwest after the War Between the States. The stories in the book were adapted from the memoirs of Elfie May Loverin Minard and a family history written by her “double cousin,” Frank Clyde Sheldon, Keithahn’s grandfather. Katie Kangas, Keithahn’s oldest granddaughter, provided the watercolor illustrations for the stories, and Hazel Keithahn, her youngest granddaughter, lent her hand to create the playful Elfie font that is a signature throughout the book. 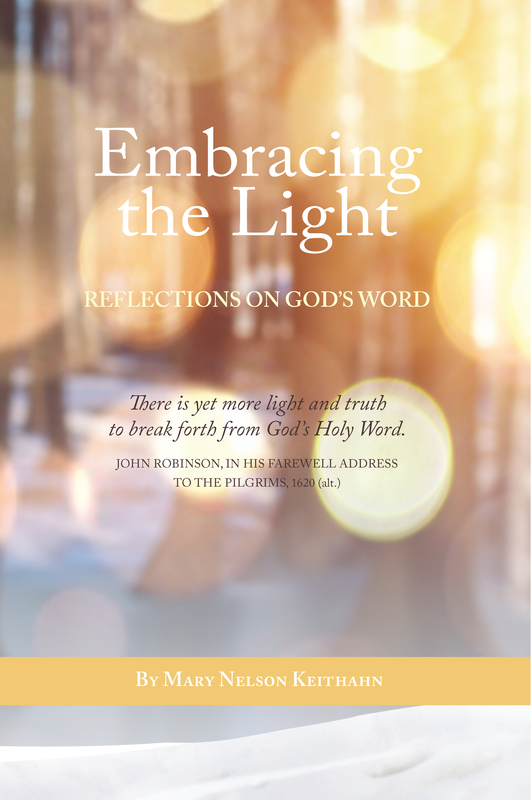 Embracing the Light is a book of scripture-based meditations and prayers that provides thoughtful reflections on Christian faith, life, and mission within the framework of the liturgical and secular year, as well as insights into important life events from birth to death and issues such as peace and reconciliation and caring for one another. The author uses hymns, stories from various sources, and her personal memoirs to offer fresh insights into the Bible. Although they belong to different genres, both books highlight Keithahn’s passion for inspiring present and future generations to reflect on their personal journeys, the history of their families, and the ties that bind them together. Both books offer opportunities for thoughtful conversations among readers of all ages. 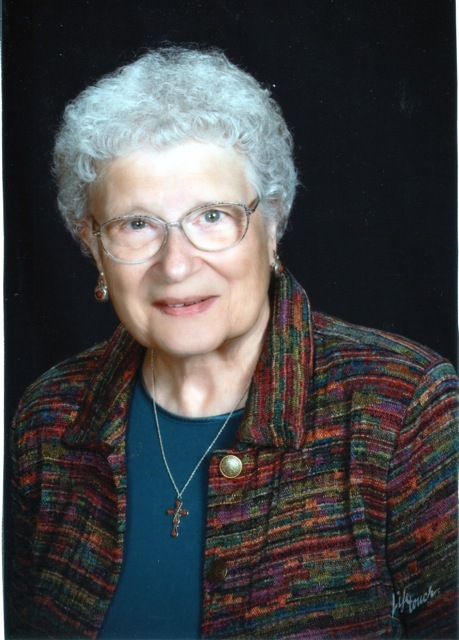 Mary Nelson Keithahn, a graduate of Carleton College and Yale Divinity School, is a United Church of Christ pastor and educator, now retired and living in Rapid City, South Dakota. She still works out of her home as a freelance writer, lyricist, and hymnwriter. She has written curriculum and worship resources for denominational and ecumenical use, numerous articles for religious journals, the book and lyrics for ten multi-generational musical dramas, and over a hundred hymns, some of which appear in more recently published hymnals and supplements. Her hobby is genealogy, and she is working on a history of her extended family. She also enjoys traveling in this country and abroad. She writes from a lifetime of experience as a pastor’s wife, mother, and grandmother, and as a volunteer in various areas of community life. If you click on the image, a larger version will pop up. 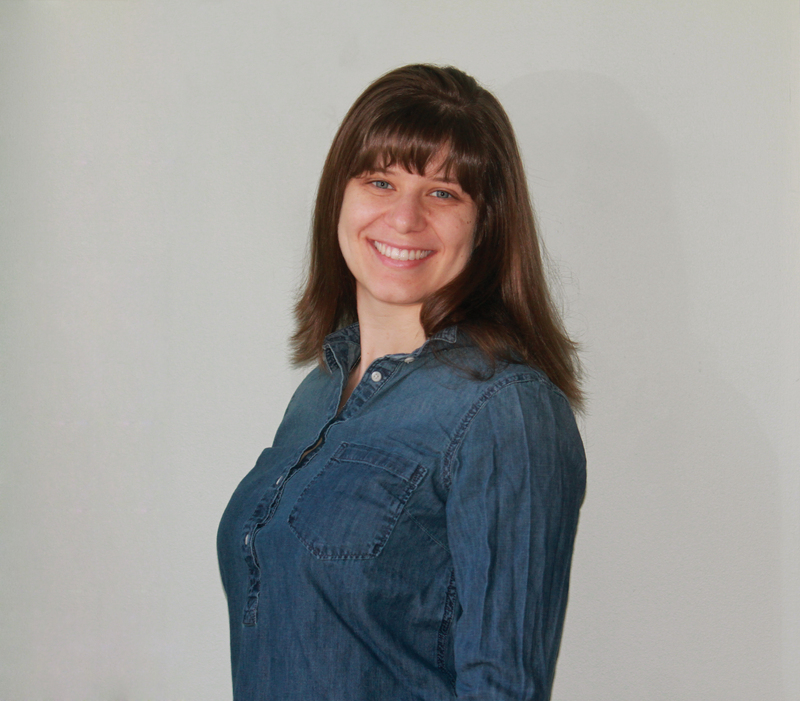 Katie Kangas shares her grandmother’s love for children’s books and family heritage. When she isn’t sketching and painting from her home in Shoreview, Minnesota, she works in an architecture firm. This is a little book of wisdom offered in an unassuming and humble spirit. Mary’s rich and varied spiritual journey includes several strands of experience that come together beautifully in this well-structured and readable volume. She is a pastor nurtured in the Congregational tradition, but ecumenical in spirit. She is living a long and varied life full of international travel, yet rooted in the values and straight talk of the Midwestern heartland. In sharing her personal story, she draws upon national and international events over the last 70 years that have shaped our time. Finally, Mary is a poet – more specifically, a hymn writer – with the ability to say in a few well-chosen words what would take most of us many pages to articulate. Through Mary’s story, we gain insight into our own faith journey. Mary’s ability to weave sacred stories from scripture with stories from her life make this book rich indeed. Reframing Browning for a more gender neutral (and fluid) time, this message of aspiration and hope flows through the meditations she offers from the perspective of one with roots deep in the down-to-earth Midwest, but who has traveled widely and with an open heart to learn from a variety of spiritual traditions. As an environmental lawyer and law teacher, I strongly relate to her stories about the Lakota people. Their “Circle of Love,” and belief that all creatures are interrelated – “the four-legged, the two-legged, those that fly and those that swim, even those that are inanimate like rocks and water” – remind us that what happens to one affects everyone. What a relevant message for us today, in a world of drowning islands and devastating storms. Interim Dean of Students and Professorial Lecturer in Law, George Washington University Law School, Washington, D.C. Embracing the Light offers dozens of charming vignettes, often personal to the author, that lead to fresh observations about scripture and God’s nature. Rev. Keithahn includes both uplifting and painful, emotional reflections. General readers will find this book useful as a daily or seasonal devotional, or for particular occasions that call for faith exploration. Embracing the Light would also be a great help in crafting or reading devotions for small group or church committee meetings. Since the author organizes her reflections by subject matter and by Christian calendar, it is very easy to find a thoughtful reflection very quickly. Many times I have felt the pressure to provide an interesting, but relatively short, devotion before starting a meeting. This book is tailor-made for that use and will keep me equipped for the foreseeable future! Rev. Keithahn’s love of hymns shines through in the book. She includes references to hymn lyrics in a large portion of her reflections. It is refreshing to dwell on those lyrics rather than just putting the hymnal right back into the pew after singing. Also worth noting are her several references to Swedish, Japanese, and other cultural traditions. Her discussions of the spiritual practices of the Lakota people of her South Dakota home are particularly interesting. These commonsense and thoughtful reflections on age-old questions of faith approach familiar scripture with a new twist, making each short essay a delight and surprise. Mary offers faith with intelligence. She isn’t afraid to engage our minds as well as our emotions, and doesn’t ask the reader to lay aside complex and critical thinking. Mary brings to this familiar format her deep appreciation for and knowledge of hymnody, which enables faithful readers to sing their faith by encountering not only the scriptures but songs of faith. Mary’s use of hymns is refreshing, encouraging us to connect the hymns with the themes of Christian living while inviting us to get to know the people and the stories behind the hymns. Each reflection is accompanied with a short and direct prayer that can be used in a variety of settings. There are some wonderful nuggets that caught my attention and engaged my imagination. I can’t think of another time when I have been inspired to think of God as long underwear, and it is an image that has stuck in my mind. This is a book that will find a prominent place on my desk where I will be able to reach it often, not just to read, but also to loan to others. Just reading the Table of Contents of Mary Nelson Keithahn’s book gives us some idea of the breadth and variety of the topics she addresses in more than 130 essays. Then, when we read the essays, we see the humor, compassion, and understanding she brings to all subjects, even those that can be painful to talk about. She shares with us the joy she has found in God’s love. As I read Mary’s reflection entitled “Never Doubt the Power of a Song,” a flood of memories going back many decades washed over me. Her ability to frame memories with music is powerful indeed. Elfie is a delightful story of a young girl facing her life in frontier America long ago. Elfie’s joys, challenges and everyday life will come alive to readers in this chapter book. Mary’s use of word pictures and how she wove our American history into each chapter will make it easy for young readers to put themselves in Elfie’s place. They will be able to understand and empathize with the hardships and happy times of young Elfie. Mary’s book Elfie is a loving tribute, not only for her close-knit family, but also to countless other families that had ancestors that settled our country. This book will make a valuable contribution to children learning about their state history, immigration and the importance of families. Elfie Loverin Minard, born just after the Civil War, was a young girl when her parents brought her to their Iowa homestead in a covered wagon. Life on the prairie was rich in experience, but sometimes difficult, and when Elfie was 90 years old, she recalled it in her memoir. Mary Nelson Keithahn found Elfie’s story while researching her family history, and used it to write Elfie: Adventures on the Midwest Frontier. This is a wonderful book for grade school readers, both for its clear, readable prose and charming illustrations, and for its depiction of a part of American history important to us all. Enjoyable for all, especially those who love the Little House on the Prairie series. I have read Elfie and I found it to be delightful. I wanted to continue to read chapter after chapter. I think students will enjoy reading it as well. I did several readability tests, of page 85, 67, and 55. It comes up at varying levels but mostly grade 5. This is nice because we teach history in grade 5 so the readability would work out nicely. It would also be a good book for younger children, even though it may have to be read to them. It would be a good read aloud book to improve listening comprehension for the younger grades. I believe it will maintain their interest. I also see many opportunities to spring board from for writing exercises. The length of the chapters is nice also. A student could easily read and then respond to the text within a reading period. The questions after each chapter were thought provoking and mostly of higher order thinking. Teachers will love that! It is also formatted well. A teacher could easily “jigsaw” the text without compromising the story. (It is a reading strategy that breaks the text down assigning different parts to different students.) This strategy would also give students a chance to dialogue with their classmates about what they have read. I can see Elfie being a terrific addition to a curriculum unit on pioneer life. When I was the K-5 librarian in two Missouri elementary schools, the fourth grades studied Laura Ingalls Wilder in great depth because the family settled in Missouri. I purchased many titles dealing with this time frame and they were popular with the students. Here in Oregon, pioneer life, especially along the Oregon Trail, is a focus and I would imagine the same is true in the other Midwest states studying western migration. There would be a market for this book. The questions at the end of the chapters encourage discussion and are relevant to the subject of the chapter. I enjoy genealogy and find the topic of double cousins intriguing. The way in which Elfie is told may encourage youngsters to delve into their own family histories. This heartwarming story, based on actual family diaries and letters, will delight and interest readers grades 3-6. Each chapter is a story based on actual events that Elfie and her family experienced as they moved throughout the Midwest. The charming and beautiful illustrations enhance Elfie’s stories. The questions in the section, “Something to Think About,” at the end of each chapter, will expand the knowledge of the American frontier for young readers, as well as for teachers, and parents. Mary Keithahn’s research into her family’s history is an excellent addition to the classroom curriculum. I am so glad that my friend Mary Keithahn sent me her children’s book Elfie: Adventures on the Midwest Frontier. The stories that make up this book are taken from historical events in the Loverin and Sheldon families. They are not only interesting to read but also inspire curiosity about how our country gradually spread from one coast to the other. I love the illustrations by Katie Kangas, beautifully whimsical watercolors that add quaintness and a sense of authenticity to the stories. I can’t wait for summer to arrive so that I can read the chapters aloud to my two granddaughters at our beach house. The questions at the end of each chapter will help me assess their comprehension and review previous chapters before moving on to new ones. As a former elementary school teacher, I know the importance of reading for detail and this book is a beautifully created chapter book that fills that niche. Elfie should find its way easily into school libraries everywhere.